March 02, 2017, 4:51 p.m. In November 2013, the Oxford English Dictionary declared "selfie" its Word of the Year after usage of the term grew 17,000% from 2012. Despite this selfie boom, new data suggests that in the past few years selfies have only grown in popularity. 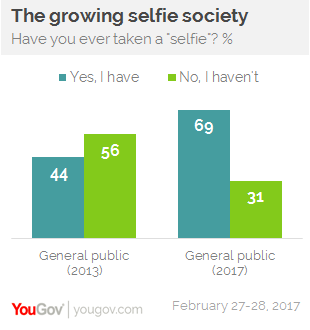 In December 2013, a YouGov poll found that 66% of US adults were either very or somewhat familiar with the word "selfie," while only 44% had actually taken one. Today, however, the numbers have increased dramatically — 94% of Americans are familiar with the term, and, at 69%, the majority of people have taken one. With the increasing prevalence of selfie culture, many attempts at creating viral content through the selfie have gone massively awry. This raises the following question: "Where is the right place to take a selfie, anyway?" According to recent data, the answer is largely the same as it was back in 2013. Most Americans agree that it&apos;s acceptable to take a selfie at a party, wedding, restaurant, or tourist destination. 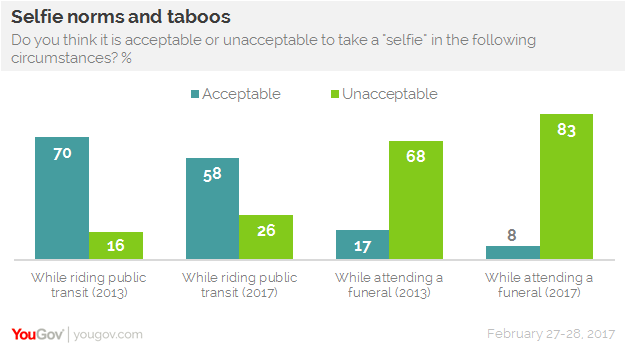 While over half of America finds it acceptable to take a selfie on public transit, this rate of acceptability has dropped from 70% in 2013 to 58% in 2017. On the other hand, US adults, both then and now, find it unacceptable to pose for a selfie while bathing or attending a funeral. The number of people who consider it bad behavior to take a selfie at a funeral, however, has increased from 68% in 2013 to 83% in 2017. As the number of individuals taking selfies rises, social media feeds have become flooded with the digital self-portraits. When asked how they felt about seeing selfies on social media, over a third of people said they were sick of them. About four in ten said they see the right amount, while hardly anyone wanted to see more.